Citation: Gatto LAM, Demartini Z, Koppe GL. Endovascular treatment of vein of Galen aneurysmal malformation of mural type. Cogn Neurosci J.2018;1(1):1-3. Vein of Galen aneurysmal malformations (VGAM) usually have multiple arteriovenous connections draining into an enlarged embryonic precursor of the vein of Galen and can be classified in choroidal and mural types. Clinical presentation includes headache, seizure, hydrocephalus and congestive heart failure. Embolization is the first treatment option. This report describes a case of successfully embolization VGAM of mural type performed in a child achieving total cure. Vein of Galen malformations, Brain vascular malformations, Endovascular procedures, Infant. The vein of Galen aneurysmal malformations (VGAM) are vascular anomalies associated with an enlarged cerebri magna vein. Lasjaunias et al. classified them in two groups: “true” VGAM and dilatations of the vein of Galen, secondary to parenchymatous high flow arteriovenous malformation draining to this vein . The VGAM is characterized by abnormal arterial connections to the median prosencephalic vein, embryonic precursor of cerebri magna vein [2,3]. According to the angioarchitecture, VGAM are divided in choroidal and mural types [1,3]. We present a case of VGAM mural type cured through a single session of endovascular treatment. A full-term boy presented with increased head circumference and prominent facial veins on 3rd month of life. Investigation with chest radiograph showed mild enlargement of cardiac silhouette (Figure 1) and encephalic magnetic resonance (MR) evidenced dilated vein of Galen (Figure 2). 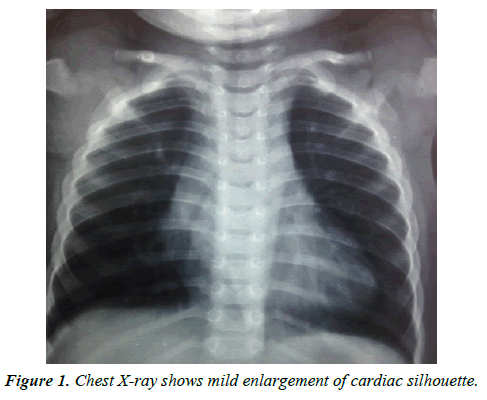 Figure 1: Chest X-ray shows mild enlargement of cardiac silhouette. Figure 2: Preoperative brain axial MR shows flow-void corresponding to a dilated vein of Galen. Since the neuropsychomotor development was normal, the child was followed clinically by the neurosurgery and transferred with 17 months to treatment. Digital subtraction angiography (DSA) showed mural type of VGAM, with a high flow fistula feed by ectasic posterior choroidal arteries, which were occluded with in the same surgical time (Figures 3 and 4). Figure 3: Month postoperative control shows thrombus into the vein of Galen, which decreased in size. Figure 4: Selective angiogram of the right vertebral artery shows early filling of a dilated vein of Galen by aferences from posterior coroidal arteries. An uneventful trans-arterial embolization was performed with 3 coils and Onyx filling the aferences and achieving total obliteration. Postoperative evolution was satisfactory, and patient discharged 2 days after the procedure. Control MR in 6 months and DSA 1 year later evidenced reduction of the vein of Galen and no residual fistula (Figures 5-7). The patient maintained normal growth and development. Figure 5: Endovascular treatment was performed by trans arterial approach, with microcatheter evidencing single fistula. Figure 6: Filled with coils and liquid glue achieving total occlusion. 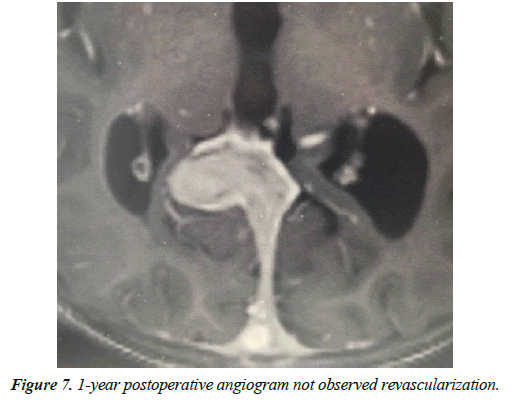 Figure 7: 1-year postoperative angiogram not observed revascularization. The VGAM are rare, with incidence estimated around 1% of all intracranial vascular lesions [3,4]. They classically manifest during neonatal period with severe congestive heart failure, but also can present with hydrocephalus, epileptic seizures, development delay and hemorrhage [3,4]. In the embryologic life the median prosencephalic vein drains choroidal plexus into a primitive accessory sinus, called falcine sinus . That vein normally regresses around 10th week of fetal development and its caudal residual remains as cerebri magna vein . The persistence of median prosencephalic vein is associated with fistulous connections to the choroidal arteries, which cause dilatation of the vein of Galen due to direct blood flow and venous hypertension [5-8]. Usually the sinus rectus is absent, and the malformation drains to a persistent falcine sinus . Lajausnias et al. . classificated VGAM and divided it in choroidal and mural types. The choroidal type is more common and usually has many high flow fistulas from choroidal and pericallosal arteries, as well as thalamoperforating and subependymal branches, leading to heart failure at neonatal period [2,3]. The mural type has blood supply from collicular and posterior choroidal arteries and causes macrocephaly, development delay or a few heart symptoms . Hydrocephalus may also occur due to venous hypertension blocking the absorption of cerebrospinal fluid or cerebral aqueduct compression by the dilated vein . Prenatal diagnosis may be done by echographic studies with Doppler and complemented with intrauterine MR, what allows to set the delivery at an appropriate hospital and to insert a catheter into the umbilical vein . Thorax radiography and echocardiography shows cardiomegaly, while cranial computed tomography [CT] and MR confirm the diagnosis and display size and morphology of the vein of Galen, as well as hydrocephalus and ischemic lesions . CTAngio and MRangio revels details of angioarchitecture and feeding vessels . Although DSA still is the gold standard examination, because the radiation it is normally performed by the same approach during the treatment. VGAM treatment depends on clinical presentation, age and angiographic findings. Unstable neonate may require early intervention, but babies with congestive heart failure should be treated medically until aged 5-6 months . Endovascular treatment presents better outcomes and is the first choice since open surgery has a high mortality rate [1,7]. The embolization is performed by trans-arterial, trans venous or combined approach, using coils, cyanoacrylate or Onyx glue . The goal is to decrease the blood flow through the fistula reducing the venous hypertension and blood steal, which allows clinical improvement despite lack of total obliteration of the fistulas . Two metaanalysis with showed good neurologic outcome rate were 62%- 68%, with mortality of 10% [9,10]. Treatment indications that followed the Bicêtre neonatal evaluation score had significantly higher rates of good neurologic outcome, while newborns with congestive heart failure have worst prognosis . Complications of the procedure include cerebral hemorrhage and ischemia, leg ischemia, vessel perforation, hydrocephalus and sinus thrombosis [10,11]. Lasjaunias et al. . observed that when angiographic evaluation of the patients at 6 months to 1 year were normal, no revascularization was observed at later followup . Therefore, as our patient performed control angiogram 1 year later and achieved total occlusion, the procedure performed achieved cure of the malformation. Long-term follow-up is necessary in all patients to ensure a normal development without neurological deficit. Vein of Galen aneurysmal malformation is a rare congenital and potentially fatal brain vascular malformation. The Bicêtre neonatal score guides the time and modality of treatment, whose best results are by endovascular intervention. We report a successful case of a 17-month-old infant undergoing a single trans arterial embolization session using coils and embolic fluid agents. Lasjaunias PL, Chng SM, Sachet M, et al. The management of vein of Galen aneurysmal malformations. Neurosurgery 2006;59:184-94. Osborn AG. Diagnostic cerebral angiography, (2nd ed). Philadelphia, Lipincott, Williams & Wilkins, USA. 1999. Halbach V, Dowd C, Higashida R, et al. Endovascular treatment of mural-type vein of Galen malformations. J Neurosurg 1998;89:74-80. Chevret L, Durand P, Alvarez H, et al. Severe cardiac failure in newborns with VGAM: prognosis significance of hemodynamic parameters in neonates presenting with severe heart failure owing to vein of Galen arteriovenous malformation. Intensive Care Med 2002;28:1126-30. Hanner J, Quisling R, Mickle J, et al. 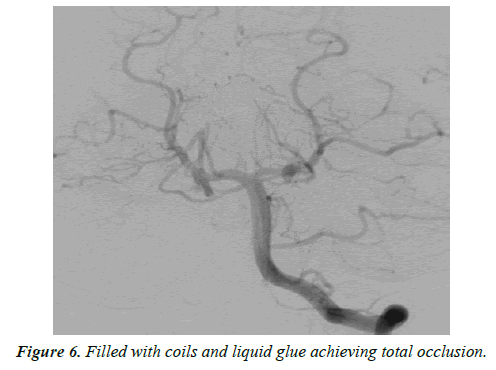 Gianturco coil embolization of vein of Galen aneurysms: technical aspects. Radiographics 1988;8:935-46. Brunelle F. Arteriovenous malformation of the vein of Galen in children. Pediatr Radiol 1997;27:501-13.
de Koning T, Gooskens R, Veenhoven R, et al. Arteriovenous malformation of the vein of Galen in three neonates: emphasis on associated early ischaemic brain damage. Eur J Pediatr 1997;156:228-29. Lylyk P, Vinuela F, Dion J, et al. Therapeutic alternatives for vein of Galen vascular malformations. JNeurosurg1993;78:438-45. Brinjikji W, Krings T, Murad MH, et al. Endovascular treatment of vein of galen malformations: A systematic review and meta-analysis. Am J Neuroradiol 2017;38:2308-14. Yan J, Wen J, Gopaul R, et al. Outcome and complications of endovascular embolization for vein of Galen malformations: a systematic review and meta-analysis. J Neurosurg 2015;123:872-90. Demartini Z Jr, Dos Santos ML, Koppe GL, et al. Sinus thrombosis after endovascular treatment of vein of galen aneurysmal malformation. Pediatr Neurosurg 2017;52:136-39.